When people plan on cleaning their homes they may begin by giving their entire home a once over scrub. Steam cleaning the carpets may follow, and organizing closet space to maximize efficiency is a given. However, many people forget to clean their drains as well. While a seemingly minor issue at first, failure to clean your drain can lead to serious blockage issues in time. In some cases, a homeowner may try to solve their bathtub draining issues by purchasing a retail drain cleaning item. They may do the same if they are unable to drain their kitchen sink. However, the aforementioned solution to drainage issues is only a temporary band-aid solution. In other words, they will only provide temporary relief. Even in the event that you think it is a slow drain you should call in a professional drain cleaning expert to ensure the entire system has not been destroyed. What begins as a small problem will quickly grow into a big problem if it is not nipped in the bud. As such, drain cleaning in Toronto should never be underestimated, and you can avoid a very severe and expensive issue by taking care of drainage issues as soon as they occur. 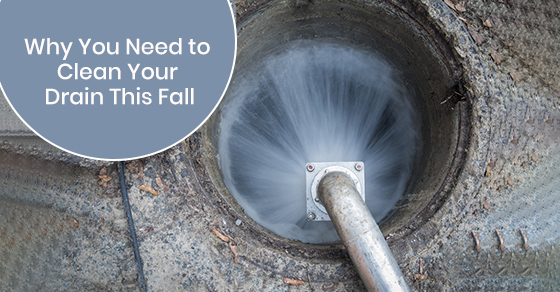 Here, we provide you with all the reasons you need to clean your drain this fall. Your toilet, sink or tub may get clogged for several different reasons. For instance, most kitchen drains become clogged due to oils or pieces of food being lodged in the system. Avoid pouring coffee grounds down your kitchen drain, and also avoid eggs and oils, as pouring such items down your drain will lead to pure chaos in various piping components as well as the pipes themselves. Also, if you have a garbage disposal unit make sure to turn it on whenever you use your drain in order to reduce draining issues from the get-go. Bathroom sinks, tubs, and showers tend to get clogged from different items. For instance, foreign objects, soap scum, and hair that has been shed will often become wedged inside pipes. If you have issues with hair loss then you may want to wear a hairnet or other such product while showering to reduce the amount of hair that lands in your shower drain. It is also important to avoid wearing any jewelry, such as rings, necklaces, nose rings and studs before you enter your bathtub. Children can often lose toys in the drains as well, so ensure that they don’t play with items such as lego blocks in the bathtub, which can easily get stuck in the drain. As for toilets, flushable wipes can often become stuck in septic systems. Cotton balls, hair and band-aids may also become stuck in septic systems, and using too much toilet paper is an absolute no-no if you want to avoid toilet clogging issues. Sometimes pipes will become clogged due to floss, food or other items. When this happens the water pressure will become imbalanced. In other words, draining your pipes will ensure that your plumbing system is working as intended. Our best advice is to call a professional plumbing company to clean your pipes thoroughly. Failure to do so in time will cause your pipes to crack. Cracked pipes, when left untreated, may cause the pipes to burst entirely. When this happens not only will you have to spend thousands to replace the burst pipes but you will also be left without any water until they are fixed. As can be seen, it is imperative that you clean your drains as often as you can to avoid headaches and massive costs in the not too distant future. It goes without saying that items that go down your drain may eventually come back up. You can look at it as a form of acid reflux or regurgitation, and avoiding such issues before they begin will save you both time and money. Obviously, many people will have to deal with a clogged toilet every now and then, but even your kitchen sink can become backed up and require the help of a professional. Sometimes a homeowner may finish doing the dishes and may notice that the water isn’t draining as fast as it should, if at all. A vegetable that was placed in the sink may float to the surface after a few minutes. To take care of such an issue perform routine drain cleanings. Or, perform an emergency drain cleaning as soon as you detect the first sign of obstruction. Performing such tasks can take care of such issues permanently and prevent your drains from being clogged. You will also avoid any unpleasant odours that will form if foodstuffs are left to rot for an extended period of time in your pipes. As can be seen, it is very important to perform drain cleanings in Toronto as often as you can. A few minutes of work here and there will potentially save you a ton of time and money in the future. If you would like to learn more about drain cleaning in Toronto and why it is so important, we can help. Brothers Plumbing is a fully licensed and bonded plumbing company in Toronto. With over 50 years of experience in plumbing and drainage techniques, we have seen and done it all. If you require a thorough cleaning of all of the pipes in your home, call Brothers Plumbing at 1-800-741-8471, or contact us here.